This spring the weather has been particularly wet and cold. If this is your first year of gardening you may be having a difficult time. Try not to get discouraged. Remember that successful Sitka gardeners do not succeed because of the weather … they succeed IN SPITE of the weather through ingenuity and hard work. There are four things that are essential if you want to succeed. At the Down To Earth U-Pick Garden, I cover almost every single bed with row cover. It costs some money and it is difficult to keep in place, but it is well worth it. As early as May 10, I was picking BEAUTIFUL spinach and I know it’s mostly due to row cover. Row cover is a lightweight fabric-type of material that is usually made out of spun polyester. It protects plants while allowing light and water to flow through it. It comes in varying widths and lengths that you lay over your beds. Using it can increase the temperature of the bed by as much as 10 degrees. It protects plants from wind, deters harmful insects and minimizes rain damage. Although it works to simply lay it over the bed and let the plants push it up as they grow, it’s best to suspend it using PVC pipe, wire hoops or fencing that’s bent into arches to keep it from soaking up mud and weighing down the plants. Even though it is fragile, row cover can last for years if you handle it carefully. Weigh the edges down firmly to keep it from it from whipping around in the wind and avoid laying it over sharp edges. I lay seine web over the top of my row cover to keep it smooth and secure. I leave my cover on until July 15 or harvest time, whichever comes first. DON”T GIVE UP! Just take note of the problems you are having this year and get advice on how to improve things for next year. Most vegetables we grow here don’t mind the weather and will recover once it warms up and the weather improves. 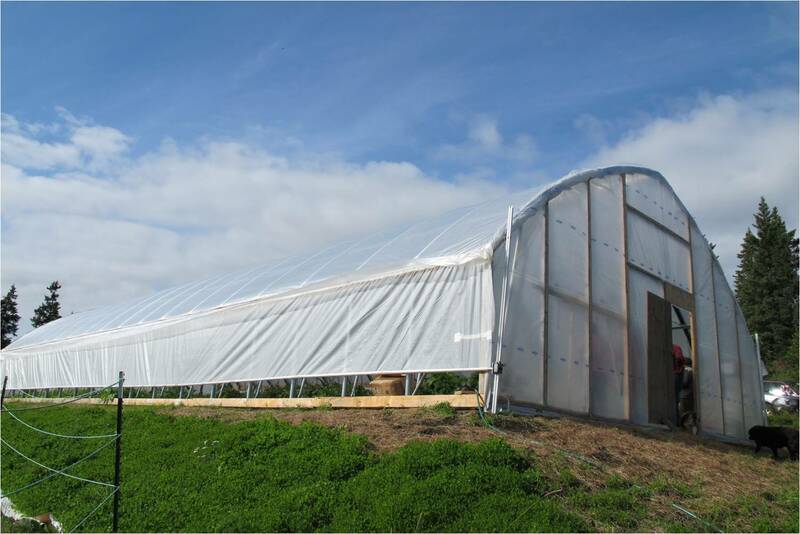 The U.S. Department of Agriculture’s Natural Resources Conservation Service (NRCA) is offering a cost-sharing program that enables qualifying landowners who produce food to build high tunnels. High tunnels, also known as hoop houses or temporary greenhouses, can help extend the growing season at both the start and end of the season so more food is produced. High tunnels are different than greenhouses in that they are passively heated by the sun, so they have lower energy costs than greenhouses. 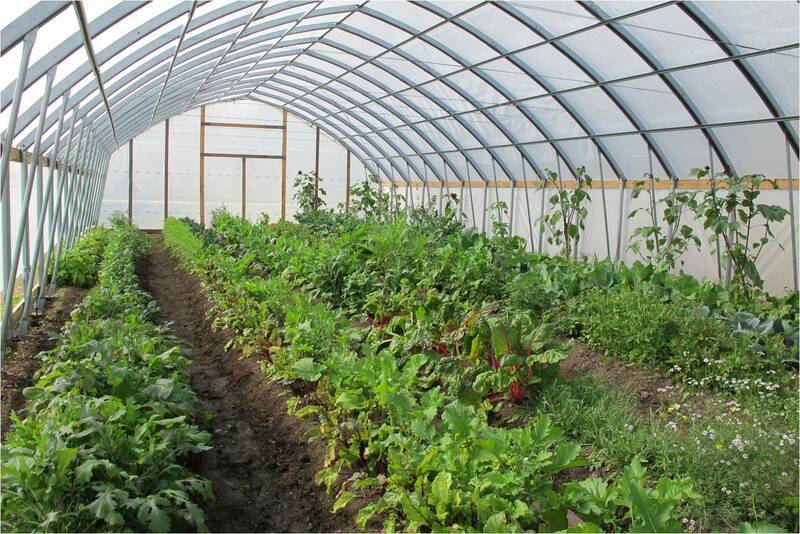 Food in high tunnels is planted either directly into the ground or in raised beds. To learn more about the USDA’s high tunnel program, click here. This link has frequently asked questions and answers. NRCS will provide cost-sharing funds on structures up to 2,178 square feet (5 percent of one acre). Both the land owner and land must meet certain eligibility requirements. Funding is provided on a reimbursable status once the high tunnel is installed and certified to meet NRCS standards. For information regarding the NRCS technical service or program participation in Southeast Alaska, please contact the Juneau field office at (907) 586-7220 or samia.savell@ak.usda.gov. Applications currently are being accepted for the 2013 fiscal year (Oct. 1, 2012, to Sept. 30, 2013) and applications must be received at the Juneau field office on or before June 15, 2012. For contact info to other Alaska field offices, click this link. When I found out that Sitka gardeners grow celery I was amazed. I didn’t know it was possible, that only commercial farmers could do it. But celery is easy to grow if you have a few tips. Plant celery seeds indoors mid-February. They take a long time to germinate and grow very slowly, so don’t get discouraged. Once they’ve sprouted it is likely that you will have problems with aphids. I don’t know where they come from. Even though I sterilize my sunroom and use sterile potting soil, I still get aphids. The best natural way to get rid of them is to mix up a solution of one gallon of water and one tablespoon of dishwashing liquid to spray over the entire plant – especially the underside of the leaves where the aphids like to hang out. According to the Internet it isn’t necessary to rinse the soap off. You might have to spray two separate times to be sure they are all dead. This past week a friend helped me spray my celery and she suggested that I start spraying them a couple of times when they are little as a preventive measure instead of waiting until the plants are large, hard to handle and covered with aphids. I think that’s a great idea. As far as soil preparation is concerned, celery likes rich soil that is almost boggy, so do not let it dry out. Amend with nitrogen-rich material such as salmon and seaweed in the fall or herring roe and seaweed or commercial fertilizer in the spring. Adjust your pH balance by adding lime or seashell sand. Transplant seedlings outside about mid-June. Make a “dish” shaped depression in the soil to act as a catch basin for water, dig a hole in the center, bury the start as deep as you can without covering its growing center, firm the soil around the base of the floppy plant to get it as upright as possible. Then spread an inch or two of seaweed over the surface of the soil to retain moisture and cover the entire row with row cover. During the first weeks after transplanting, the outside stalks of the plants may start to yellow and die from transplant shock. Use a scissors to carefully clip away dying stalks close to the base of the fragile transplants. When outside stalks stop dying and the center of the plants begins vigorously growing straight upwards, you will know that your plant is happy. Do not wait for your celery plants to get as large as the ones in the supermarket before harvesting. Your plants may never get that big. Wait until the plants are sturdy and the outside stalks are big enough to suit you and then, while supporting the plant with one hand, twist and pull a stalk from the base of the plant with the other hand while using a down-and-out type of motion. Do NOT cut the stalks off of mature plants with a scissors leaving a stub behind to rot and never take more than one-third of the plant at one time and it will keep producing sweet delicious stalks well after our first frost. Don’t forget that the celery leaves are edible too and make a great addition to soups and stir-fries. Next week’s column — How to cope with Sitka’s weather. I have been a Sitka Sound herring researcher for about 10 years. I have decided to share my few thoughts on the Sitka Sound herring population. With this said, in my opinion there was not 144,143 tons of the predicted mature herring biomass returning to Sitka Sound. An overestimate of the biomass seems to be the suspect. Managers of forage fish know that traditional stock management techniques do not work well with forage fish. 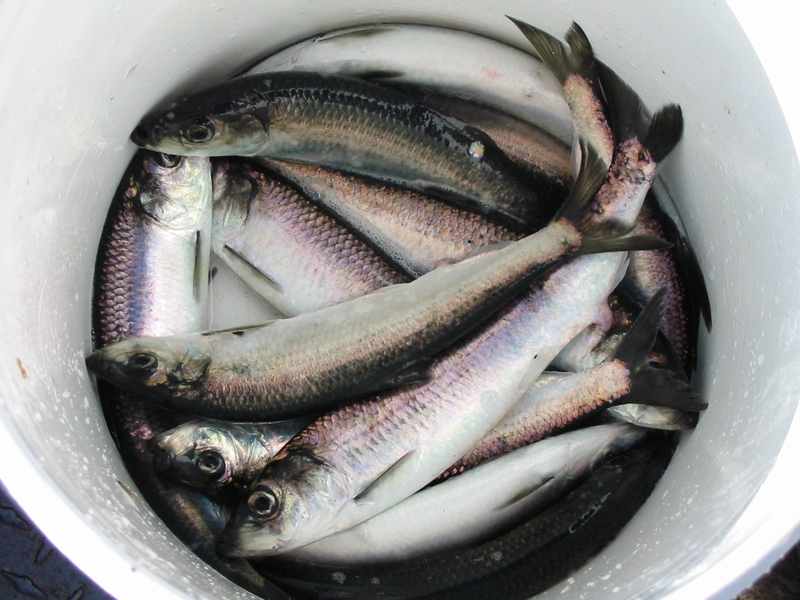 The reason for the failure of traditional stock assessment techniques is that the “catchability” of forage fish increases as the stock declines. However, due to the schooling nature of forage fish and their vulnerability to modern acoustics and fishing gear, catch rates remain constant, even when the stock is rapidly falling in size (Beverton, 1990). Thus declines in stock size will not be apparent to managers or to the fishing industry, based on catch per unit effort statistics. 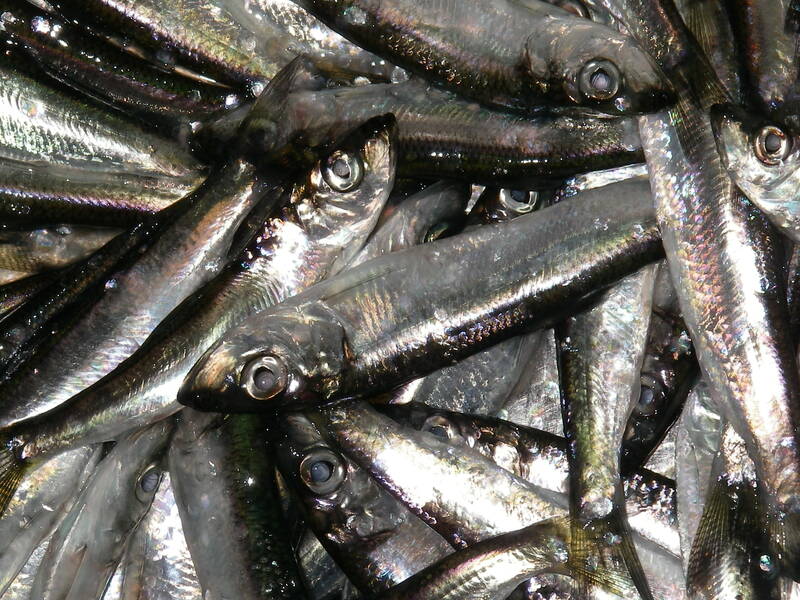 Management of forage fish stocks requires direct measurement of stock size. This can be accomplished by surveying fish abundance during the spawning season, or by conducting scientifically designed acoustic surveys of schools of forage fish. Failure to monitor the stock directly will result in the inability to determine changes, even severe declines, in forage fish abundance. With that said, ADF&G does not measure the Sitka Sound herring stock directly. They may do acoustic surveys and aerial surveys but the data is not used for determining stock size in the ASA model. ADF&G relies almost entirely upon spawn deposition estimates to determine the spawning biomass. Hebert, 2010 states, “Estimates of total egg deposition on Macrocystis kelp may be highly variable, and transects that cross Macrocystis kelp beds could result in very high egg deposition estimates, resulting in high uncertainty around total estimates of egg deposition.” ADF&G also notes in this report that they have issues with diver calibration. One diver may visually estimate more or less eggs compared to another diver. Individual calibration factors can have a potentially large impact on spawn deposition estimates of biomass. Accurate and regular estimates of fecundity are important for “ground-truthing” assumptions used by ADF&G. Fecundity estimates are used to convert estimates of herring egg deposition into mature biomass, and is used quite commonly among world-wide herring managers. ADF&G has only measured fecundity 4 times since the 1970s (Hulson et al., 2008). Since then, they just estimate fecundity based on weights, so large female herring lay approximately 40,000 eggs and small female herring lay approximately 20,000 eggs. Using un-validated parameters is extremely risky. For example, a 10% change in the egg per gram measurement used to convert spawn to fish, can result in a 20% change in the number of fish estimated. In 2007, 2008, and 2009, spawning herring were sampled for Ichthyophonus prevalences in Sitka Sound. The results showed that 27% – 40% were positive for Ichthyophonus. All of this data is provided by Hershberger, Winton, and Purcell, from USGS Marrowstone Marine Field Station. The results of the 2010 and 2011 data from this ongoing research were not available at the time of this letter. Sitka Sound herring have had the Ichthyophonus disease for years and ADF&G has not incorporated this data into their current management. The ASA model does not account for disease, just “natural mortality.” However, this “natural mortality” is not based on observed data, but has been estimated by picking a random, but “conservative” number and applying it to the herring stock. Sitka Sound herring follow the Pacific Decadal Oscillation (PDO) which is a 14-year oscillatory cycle and is highly correlated with an annual index of zooplankton biomass. Strong negative values of the PDO were observed in autumn 2011: “If these values persist through winter and early spring 2011-2012, they could result in the best ocean conditions observed in decades,” according to the 2011 annual update for the Ocean Ecosystem Indicators of Salmon Marine Survival in the Northern California Current research project, which has been ongoing since 1998. Additionally, “These negative values are expected to continue into spring 2012, which suggests that the northern North Pacific Ocean will also remain cold through spring 2012, giving rise to continuation of good ocean conditions.” So it is hard to imagine with this optimal ocean condition that Sitka Sound herring experienced mass mortality since last year. This winter we experienced the Arctic Oscillation which is essentially a pressure pattern that drives the jet stream, and controls how strong its winds are and where the jet stream position is. This winter, the jet stream trough, which tends to push the jet stream far to the north, helped drive storms into Alaska. From 2006-2010, ADF&G has been trying to convince the public that the Sitka Sound herring had changed their maturation rates. They claimed that the herring were maturing later. Instead of herring reaching maturity at age-3 and age-4 they were not maturing until age-5, age-6, and age-7. Of course this was not actual observed data. ADF&G did not base this on ovarian histology or anything concrete, instead the changes were based on a number estimate to make the ASA model fit the data rather than using field data to fix the model. No other herring stocks along the Pacific Coast have herring delaying maturation, so it shouldn’t surprise anyone that Sitka’s herring are maturing at their usual rate. Additionally, ADF&G claimed that the herring were surviving longer, and the survivability rate they have been using is 87%. Again this was not based on anything managers actually observed, but was again a random number forced to make the ASA model fit the data. Even Hebert, 2010 states “External estimates of age-specific survival would improve the ASA model and provide more accurate forecasts of spawning biomasses.” If the Sitka Sound herring actually had 87% survivability rate, then the only way herring could have died was to be eaten by a predator or get caught in a purse seine net. In 2008, I did a co-study with the ADF&G Age Determination Laboratory in Juneau. ADF&G collected 50 herring from the winter bait fishery and aged the herring via scale reading. I then received those 50 herring and aged them via otolith aging – and this is not the break and burn method, this is the thin-sectioning method that is widely recognized world-wide and even used by the California Department of Fish and Game on herring stocks. The herring aged via otolith actually aged 2 years younger on the average than the scale aging methodology. If you recall, ADF&G announced 12/16/2010 that their aging assessments were wrong for the period of 1999-2010. Once they re-aged all of the archived samples, they too came up with an average of 2 years difference. 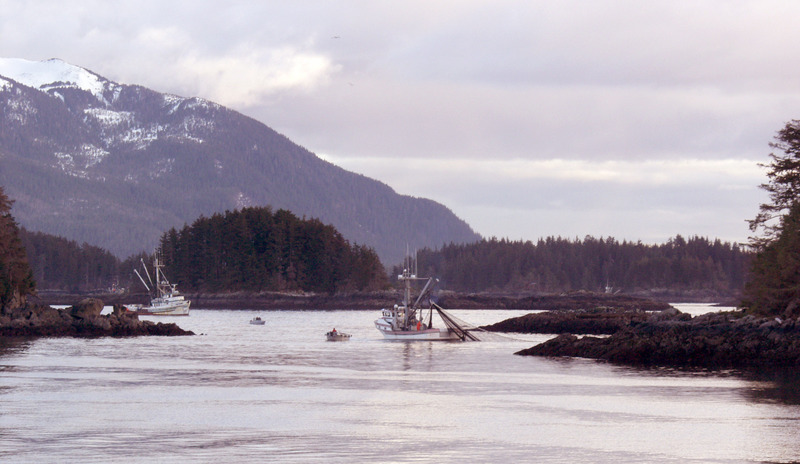 Additionally, because the ASA model used by ADF&G to forecast the mature biomass requires a long time series of reliable age estimates, the department chose not to use the ASA model, but instead relied on a biomass accounting model to forecast the 2011 Sitka Sound mature herring population. Significant fisheries-induced evolutionary change has been researched in Norway in Baltic herring and has lead to the entrainment hypothesis: an explanation for the persistence and innovation in spawning herring migrations and life cycle spatial patterns (Petitgas et al. 2006). This research is quite intriguing and deserves more consideration. In 2008, the commercial fishery occurred along the entire Kruzof Island shore line in very shallow water. While the herring schools were being fished upon, a large percentage of the spawning biomass seemed to avoid the purse seiners and hit the first shoreline available, Kruzof, and spawned. Now if you review ADF&G spawn maps that go back to 1964 you will know that there has been less than 15 times that the herring biomass used the Kruzof shoreline as spawning habitat. The Kruzof Island shoreline is not very suitable spawning habitat as newly hatched larvae would be swept up in the currents and advected out of Sitka Sound, causing low survivability (Sundberg, 1981). However, if herring spawn on the islands, i.e. Middle Island, Kasiana, or along the road system, the currents in Sitka Sound keep the hatched larvae in the inner bays and water ways which are excellent for retention and increases survivability. Keeping in mind that herring recruit into a mature cohort at around age-4, the 2008 commercial sac roe fishery may have reduced the amount of recruits that we would have seen this year in 2012. Unfortunately we will never know because ADF&G does not measure immature herring. I have researched juvenile herring populations in Sitka Sound for several years and found that one of the most important rearing areas is along the Halibut Point Road shoreline from Katlian Bay and Nakwasina in the north to Halibut Point Marine and Cove Marina in the south (Meuret-Woody and Bickford, 2009). Unfortunately, the new dock at Halibut Point Marine will soon become a place for net pen-rearing of hatchery salmon smolts – with no consideration on the impacts it could have on juvenile herring populations. Finally I’d like to point out that ADF&G staff has been quoted saying that herring only seem to spawn in Salisbury Sound when there is such a large biomass that extra spawning habitat is needed. So basically they claim Salisbury Sound is a spill-over spawning habitat, although they have no data to support this assertion. If this were actually true, based on biomass size, then where was the huge spill-over of spawning biomass in Salisbury Sound in 2011 and 2012 – both of which were huge forecast biomass years? In my published paper, Identifying Essential Habitat (Source vs. Sink Habitat) for Pacific Herring in Sitka Sound Using Otolith Microchemistry (Meuret-Woody and Bickford, 2009) it appears that Salisbury Sound actually supports a small discrete population of herring (10%), separate from Sitka Sound herring. Salisbury Sound may also be a source population for Hoonah Sound, supplying approximately 14% of the population for Hoonah Sound. Why doesn’t ADF&G rely on published data instead of relying on guesses made by their managers? When I first started growing peas in Sitka I had terrible results. Some people said, “Why don’t you stop growing peas? They take up so much space for so little harvest!” But I was determined and kept trying different things and now peas are one of my biggest producers of poundage. The first thing you need to know about peas is that they are from the legume family. As a rule the members of this family grow pods with seeds in them; peas, beans, alfalfa, clover and peanuts are the most commonly known legumes. Legumes can do something no other plants can do – by working in a cooperative partnership with the Rhizobia bacteria found in the soil they can pull nitrogen right out of the air. In this nitrogen-fixing process nodules form on the roots and the plants store nitrogen for pod formation. When you plant peas in a garden bed for the first time there is good chance that the proper strain of this bacteria will not be present in the soil, so it is important to “inoculate” the seeds. Inoculant bacteria can be purchased in powder form and sprinkled onto the seeds at planting time. Before planting peas prep the soil with a little compost and lime and put fencing in place to support the pea plants up off the ground. I recommend growing tall varieties of edible podded peas for the most poundage per square foot. Many gardeners prefer “self-supporting” varieties because they readily grab the fencing themselves, but I have never grown them. It does take up some of my time, but I tuck the vines in myself if they grow away from the fence. The evening before you are going to plant, count out enough pea seeds to plant your row with two-inch spacing and put them in a jar of water to soak overnight. Do not screw the lid on tight. The next day pour the water off and sprinkle inoculant over the wet seeds. Plant the seeds immediately in a raised bed and then cover the row with floating row cover to prevent the birds from eating the seeds. Don’t ask me how the birds know they are there, they just do — I’ve woken up the next morning to find the entire row ripped up and most of the seeds gone. Water the soil and keep it damp (not soaked) until the peas sprout, then reduce water to a minimum until the pea plants flower. Once they flower it important to keep the soil consistently damp for optimal pod production. Try to water the ground keeping the foliage as dry as possible. It is important to pick pea pods EVERY day to encourage the plants to produce more over a long period of time. If your plants get too tall simply “top” them and throw the tender tips in your salad bowl or stir fry. When the plants die down in the fall do not remove the foliage from the row, but dig it into the soil to capture as much nitrogen as possible for next year’s crop of heavy feeding greens. Next week’s column — Everything I’ve learned about planting celery. The carrots that are grown in Sitka are the best I have ever tasted. They are so sweet that they are more like candy than a vegetable. 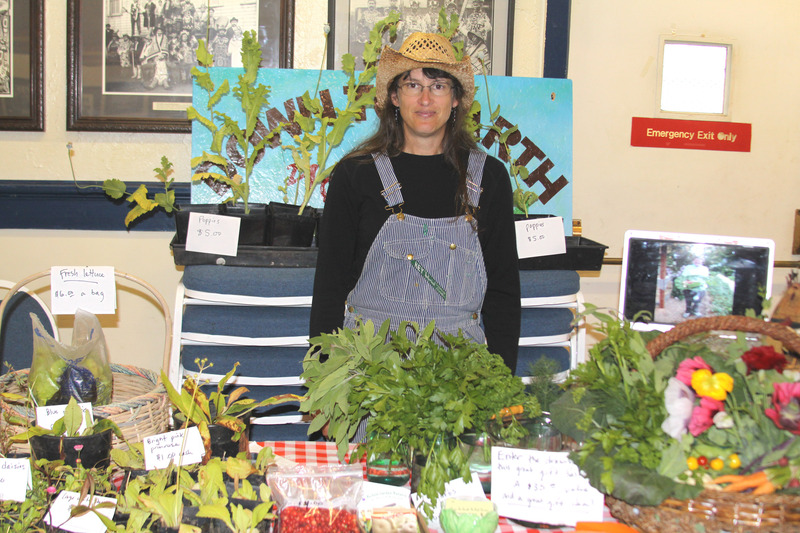 They are probably the single most popular item grown at the Down To Earth U-Pick Garden. Kids love to try to judge the size of the carrot by brushing aside the dirt and looking at the tops. I never get tired of the look of joy and amazement on their faces after they finally make their selection, pull one up and get a look at their prize. Carrots grow in fairly poor soil, don’t take up a lot of space and provide a lot of poundage per square foot. To get your bed ready for carrots, be sure the soil is not heavily fertilized. Carrots do not like a lot of nitrogen. It makes them grow beautiful, luscious tops and small, hairy roots. It’s best to amend the bed with a small amount of organic material, like broken down leaves from last fall and then, right before planting the seeds bury starfish or amend with purchased bone meal. It’s good to add sand to the soil if you can get it. Next you should sift out any gravel or sticks that could cause the carrots to become crooked or split. I grow only Nantes varieties because they are shorter with blunt ends and do not taper. This shape is best because most of my beds are not deep enough for long carrots and my soil is not sandy enough for skinny carrots to be pulled out without breaking. I used to just sprinkle the seeds on top of the soil and lightly rake them in, but I had bare spots and spots that were too thick, so I recently purchased a seeder. It is an expensive tool, but it’s important that every square inch of my garden is utilized to its full potential. With a seeder you use fewer seeds, the spacing is more consistent and you can predict where your seedlings are going to grow, which makes it easier to weed. Carrots should be spaced about two inches apart. Carrot seeds take a long time to germinate, so be sure to water regularly. Don’t let the surface of the soil dry out. Because the soil is bare of vegetation for so long, it is important to cover the entire bed with row cover to discourage cats from using it as a litter box. Another drawback of having bare soil for that amount of time is that weed seeds are given free range to sprout. My carrot bed always has the most weeds. When the carrot seedlings are about four inches high it is a good idea to weed even though it seems harsh on the fragile seedlings. They recover from weeding just fine, so be sure to get in there and pull every tiny weed. About mid to late July you should be able to start eating delicious, sweet carrots, and you will be so glad you planted them. Next week’s column — Everything I’ve learned about planting peas.